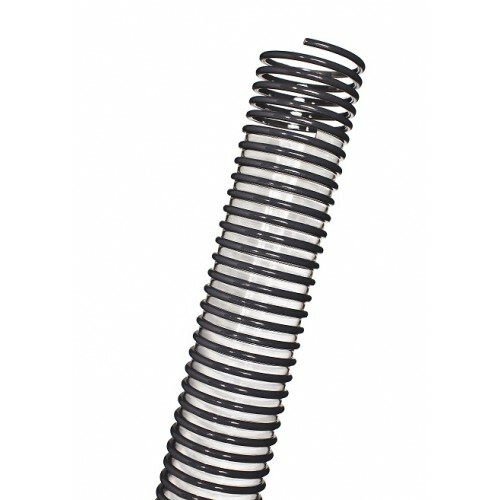 Technical Features: Ester based Polyurethane duct, reinforced with an anti-shock PVC helix. Completely smooth bore to ensure optimization of flow properties, corrugated outside. Wall thickness from 0,4 to 0,8 mm. Properties: High mechanical properties: light, really flexible, easy to bend. Really good resistance to abrasion and most chemicals. Halogens free and conform to RoHS as well as free from phthalates. Standards: RoHS 2011/65/EU Directive, REACH Regulation (1907/2006)., TRB S 2153. Suction of abrasive media such as powders, pellets, plastic granules, fibres, dust.